An awards ceremony to showcase the community work undertaken by members of the Orange Institution will return to Lisburn next month, it has been confirmed. The city’s Civic Centre will host the annual Orange Community Awards on Friday January 15, 2016. ‘The Grands’ which recognise and reward excellence within the Loyal Order, and the marching bands fraternity, continue to grow each year since their inception in 2005. Earlier this year, the awards were presented at a sold-out same venue. Next year the much anticipated event will undergo a significant revamp, with prizes in a number of categories. 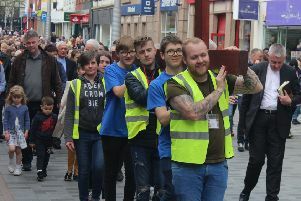 These include the popular Best New Banner, Lodge and Individual Community Involvement, Evangelical Outreach, Musician’s Merit and Sporting Excellence. A Youth Award and a new category focused on museum and schools outreach are also among the prize list. As is tradition, senior Orangeman Edward Stevenson will also confer the special Grand Master’s Award. Last year’s recipient was leading Northern Ireland business figure and co-founder of global transport company Wrightbus, William Wright. Grand Lodge Director of Services, Dr David Hume, said: “The Community Awards give a unique opportunity to highlight and reflect the outstanding commitment which many members of the Institution give to their lodges and communities, and over the years hundreds have been recognised. “As the Awards have grown so too we have increased the requirements on the venue, and so we are delighted to be returning once again to the Island Arts Centre. It promises to be another memorable occasion. A full programme of entertainment is currently being finalised, but already confirmed musicians who will perform on the night are Stonewall and gospel duo, The Thompson Brothers. Tickets can be obtained for the awards ceremony by contacting the Box Office on 028 9250 9254 or book online via www.laganvalleyisland.co.uk/events. Tickets cost £10 each. The event will commence at 7.30pm.